Join the discussion on our forums! Come discuss Fireworks Tech over in our dedicated Fireworks Tech discussion topic. She learns by trial and error. Mostly error. The card, in a vacuum looks great - like a 4 or 5 star card. But then you realize you have such poor targets for it (Harvest Golem? Spider Bomb? Nothing in neutral makes me excited as good stand-alone cards to get me excited about Fireworks Tech). Also, it's a terrible 2-drop on its own, and that should heavily cue you into knowing the card is bad - you will give up the board early and then your mech strategy will never get you caught up again. I think the card needs WAY more support. Is the wording of the card relevant to the order of the effects triggering? For example, would Meat Wagon be able to summon a 1-Attack minion if this targets it? 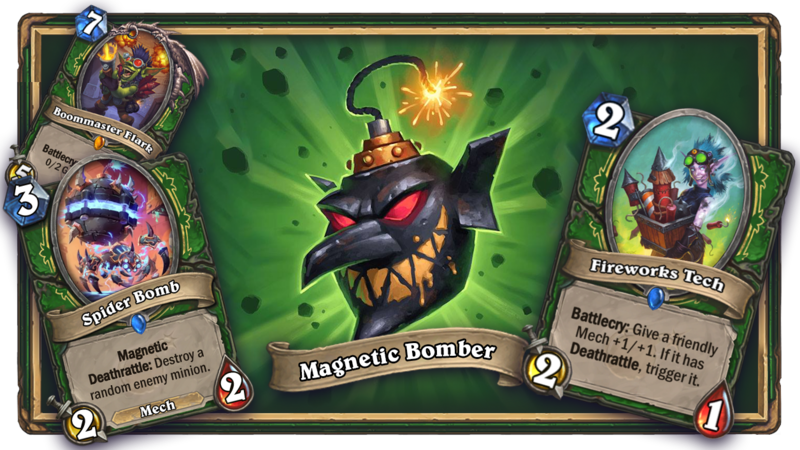 Here's my theorycraft on a Goblin Bomb deck featuring Fireworks Tech, filled with Magnetic & Mech synergy. Leaning towards building strong boards & combo threats as opposed to being too Deathrattle focussed. pretty bad right now. Not because the card it self is bad but because there's hardly any good death rattle mechs for this to see value consistently. You need a mech just to get the + 1/1 part so this card needs a lot more good early game mechs. What this card would love is possesed villager with a mech tag or crystalin oracle like card with a mech tag, or better yet both. Yeah. this card seems too good if you already have a mech on board. If you are behind on the board and can't play a Deahtrattle mech before this card..... well, we have to see what other cheap mechs will be revealed. Turn 10 Spiritsinger Umbra + Meat Wagon + Fireworks Tech with 2x Goblin Bomb in the deck = kinda meh. Better combo with Harvest Golem or Spider Bomb, Midrange Mech Hunter maybe. Mech & Deathrattle Synergy and it helps trigger cards from Boommaster Flark and Spider Bomb. Seems pretty valuable for the new deck recipes. Me used to trade for deathrattle. But now me no need to trade for deathrattle. 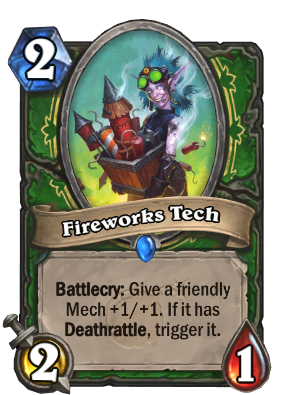 Fireworks Tech is SMOrc best friend. Even make mech friend hit face harder. One day, Fallen Sun Cleric taught her Mech to Play Dead! Honestly in my mech/n'zoth deck which I totally intend to do. I could see this being a swap out for Play Dead. Basically overpowered stuff. We do see a lot of mech synergy but not actual mechs yet.